Extraglottic airway devices (EAD) have become an integral part of anesthetic care since their introduction into clinical practice 25 years ago and have been used safely hundreds of millions of times, worldwide. They are an important first option for difficult ventilation during both in-hospital and out-of-hospital difficult airway management and can be utilized as a conduit for tracheal intubation either blindly or assisted by another technology (fiberoptic endoscopy, lightwand). Thus, the EAD may be the most versatile single airway technique in the airway management toolbox. However, despite their utility, knowledge regarding specific devices and the supporting data for their use is of paramount importance to patient's safety. In this review, number of commercially available EADs are discussed and the reported benefits and potential pitfalls are highlighted. Airway management devices that allow gas to enter and exit the airway via an airway tube, which sit above the glottis, are commonly referred to as "supraglottic airways." However, because a number of device designs incorporate components that are inferior to, but remain outside the glottis, the term "extraglottic airway device" (EAD) is more appropriate. At the time of this writing, there were not less than 25 such devices approved for clinical use in children and adults. For the clinician, the decision of which of these devices to be used can be confusing. Ease of insertion, airway seal pressure, ability to protect against gastric insufflation and regurgitation, ease of intubation through the device, patient comfort, and cost per use are some of the few myriad device characteristics to be considered. The purpose of this review is to provide a comprehensive description of commonly available EADs with particular attention to literature supporting their use. This is of particular importance, as concern exists that increasing number of airway management devices are being introduced into clinical practice without having undergone efficacy and safety examination. The evolution over time, design similarities and differences, and potential advantages and disadvantages of various EADs are also highlighted. For the purposes of uniformity, the term EAD will be used throughout this review. Brimacombe proposed a classification system for EADs based upon: The presence or absence of a cuff, whether the route of insertion was oral or nasal, and the anatomic location of the distal portion of the device in relation to the hypopharynx. However, this proposed classification includes devices that are primarily intended to help clear the airway and/or facilitate tracheal intubation. For EADs whose primary role is airway maintenance during general anesthesia, a more commonly accepted classification is that proposed by Miller. 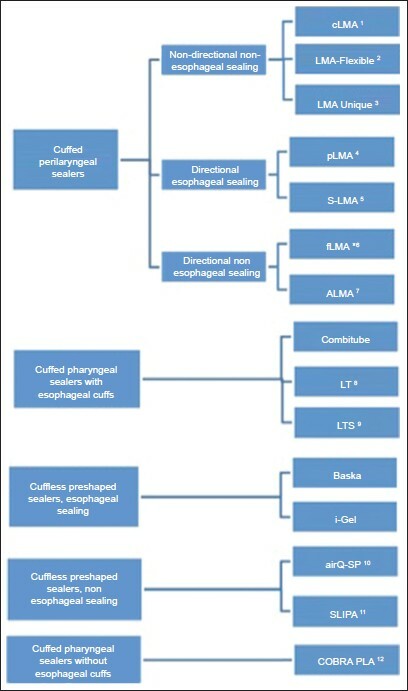 EADs are differentiated by virtue of where in the hypopharynx the cuff of the device (whether it be inflatable or anatomically pre-shaped) provides a seal, whether or not the sealing effect is directional, and whether or not esophageal sealing occurs [Figure 1]. Particular interest has been paid in recent years on devices providing esophageal sealing via the incorporation of an esophageal vent tube due to a perceived benefit in reducing the incidence of gastric regurgitation and pulmonary aspiration during airway maintenance. However, a number of studies have reported extremely low rates of pulmonary aspiration with the use of non-esophageal sealing devices. Thus, little evidence supports the routine widespread use of esophageal sealing devices over their non-esophageal sealing counterparts, particularly, as they are often more costly. Clinical use characteristics of some commonly used extraglottic airway devices are shown in [Table 1]. 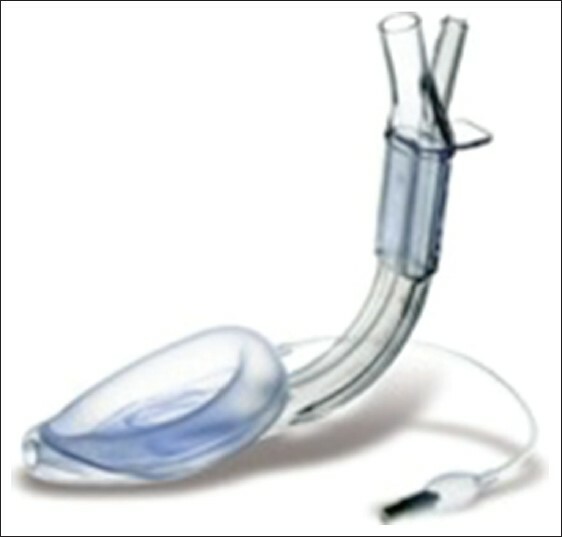 The original Laryngeal Mask Airway (cLMA, Intavent Direct, Maidenhead, UK, [Figure 2]) was one of the first EADs introduced into clinical practice. It was invented by Dr. Archie Brain in 1981 and initially introduced to the United Kingdom in 1988 and 1991 in United States. By 1995, it had been introduced in over 80 countries and used in over 100 million patients. Subsequently, a number of other laryngeal masks were introduced; each more specialized than the original. The LMA consists of two parts, the airway tube, and the mask. Reusable devices are constructed of medical grade silicone designed to provide an oval seal around the laryngeal inlet and act as a sleeve joint at the upper esophagus. The mask has a cuff, a pilot tube, and balloon through which the cuff is inflated and maintenance of intracuff pressure may be monitored. The proximal end of the shaft has a standard 15-mm adapter. Two bars at the junction of the shaft and mask prevent the epiglottis from obstructing the ventilating lumen. In contrast to reusable LMAs, the single use devices have a cuff constructed of polyvinyl-chloride, which may be somewhat stiffer and less forgiving during device insertion. Brimacombe conducted meta-analysis in 1995 to determine whether the cLMA offered any advantages for ventilation over tracheal tube (TT) or face mask (FM) and several were reported. Fewer changes in hemodynamic and intraocular pressures were observed during placement and removal of cLMA compared to tracheal intubation and extubation and when patients were awakened with cLMA in place at the end of procedure, it was reported that there was less coughing, bucking, and hemodynamic changes than waking the patient with an endotracheal tube (ETT) in place. Further, the cLMA has been reported to preserve mucociliary function, laryngeal competence, and be associated with less laryngeal trauma. Following induction of anesthesia, cLMA can be placed quickly without the need for muscle paralysis or laryngoscope. The LMA Proseal (pLMA, LMA North America, San Diego, CA, [Figure 5]) is a modification of the cLMA with an esophageal drain tube (DT), designed to improve controlled ventilation, airway protection, and diagnosis of misplacement. The pLMA offers an airway that bridges some of the gap between the cLMA and the TT. 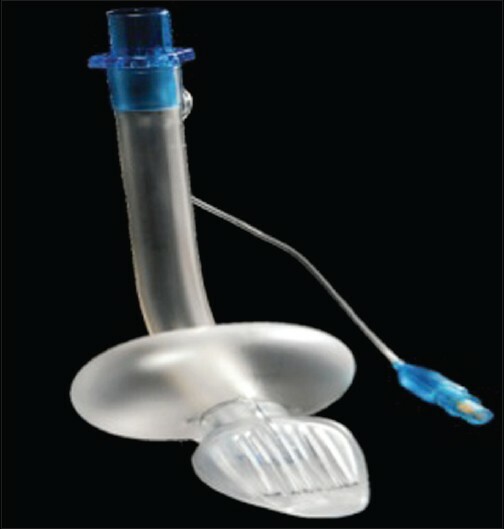 Compared to the cLMA, the modifications of pLMA include larger and deeper bowl with no grills (bowl lacks the 'semi rigid shell' of the cLMA), it incorporates a second tube placed lateral to the airway tube and ending at the tip of the mask, posterior extension of the mask cuff, integral silicone bite block, and an anterior pocket for seating an introducer or finger during insertion. The function of the second tube is to separate the alimentary and respiratory tracts. It allows escape of fluids from the stomach and reduces the risk of gastric insufflation and pulmonary aspiration and can also help determine the correct positioning of the mask. A second posterior cuff is fitted to improve the seal. There is less need for tight occlusion of the upper esophageal sphincter by the mask tip in the event of regurgitation, because of the presence of the DT. Other advantages include opportunity to pass an orogastric tube (OGT) and channeling of regurgitated stomach contents. The pLMA is reusable and recommended product life is 40 sterilizations. pLMA has a shorter airway tube than the cLMA, is wire-reinforced and has similar caliber as the FLMA. While comparing with cLMA the primary distinguishing features of LMA Fastrach (FT-LMA, LMA North America, Inc., San Diego, CA) include an anatomically curved rigid airway tube, an integrated guiding handle, an epiglottic elevating bar, (replacing the standard cLMA vertical aperture bars) and a guiding ramp built into the floor of the mask aperture. This allows optimal alignment of the mask aperture with the glottic opening and provides a conduit for ETT passage. FT-LMA is generally not considered as directional but when the metal handle is engaged the device becomes directional. The internal diameter of the airway tube is 13 mm, the minimum that is able to accommodate an ETT with an internal diameter up to 8.0 mm. With lubrication, even 8.5 and 9.0 mm ETTs may fit, but generally they are not recommended [Figure 7]. The Baska Mask (Proact Medical Systems, Frenchs Forest NSW, Australia) eliminates the need of an orogastric tube and replaces with two drains and a sump. Its oval shaped airway tube is similarly shaped to the mouth thus reducing rotation inside the pharynx. The biggest advantage of Baska mask lies in the fact that cuff deflation or inflation is not required prior to insertion. Neither is monitoring of the cuff pressure before surgical intervention required. Zundert et al., concluded that it improves safety when used in both intermittent positive pressure ventilation (IPPV) and spontaneous breathing. The soft diaphragm Bask mask cuff distends during the inspiratory phase of positive pressure ventilation, increasing the effectiveness of the seal. The Baska Mask was successfully inserted on the first attempt in 76.7% of patients and was relatively very easy to insert. The severity of throat discomfort, dysphagia and dysphonia is very low. Removal of device was also considered easy. 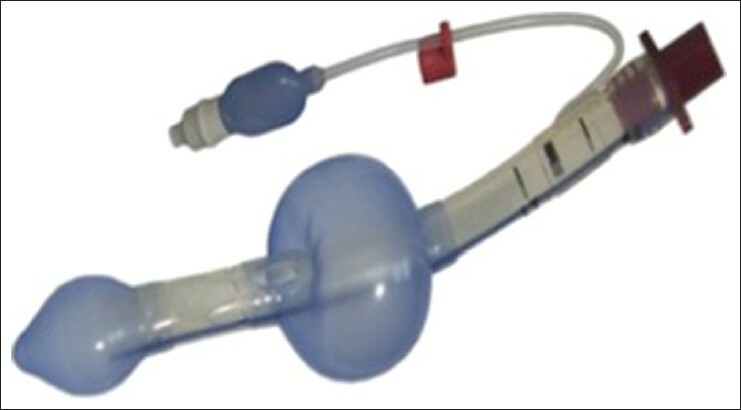 The Baska Mask also incorporates a bite block throughout the length of airway tube [Figure 12]. 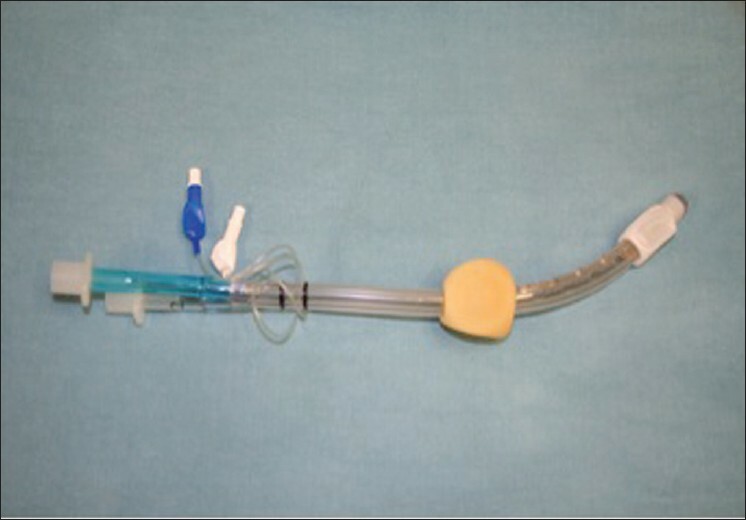 Use of introducers or catheters through a supraglottic airway can prove to be a useful alternative intubation technique and also can act as a ventilator device. The Aintree Intubation Catheter (AIC) as an intubation introducer resulted in high success rates in both elective and emergent intubations. Blair et al., did a manikin study using the AIC for tracheal intubation via the LMA Proseal and achieved a 98% success rate. Another technique involves a wire-guided approach with or without an airway exchange catheter. This involves inserting the bronchoscope into the trachea, passing a guidewire through the working channel of the bronchoscope, removing the bronchoscope with the wire in the same relative position, and then passing an exchange catheter over the wire. Intubation is highly successful but the overall insertion time is longer compared to the AIC technique due to the added steps. It has been more than 2 decades since the introduction of the first clinically useful EAD. EADs have been used safely over 200 million times over that period and, as a result, many authorities consider the development of EADs in general, but the LMA in particular, to be the most important development in airway management over the last 50 years. , EADs continue to evolve and it is incumbent upon clinicians to be intimately familiar with the risk and benefits of any member of this class of airway devices that they will be utilizing. These authors agree with the Difficult Airway Society Airway Device Evaluation Project Team (ADEPT) that evidence-based principles be applied to group or institutional purchasing decisions regarding airway management products. Further, products with documented evidence of efficacy and safety should be preferred to those where evidence is lacking. 1. Brimacombe J. A proposed classification system for extraglottic airway devices; Anesthesiology 2004, Aug; 101 (2):559. 2. Pandit JJ, Popat MT, Cook TM, Wilkes AR, Groom P, Cooke H, et al. The Difficult Airway Society ′ADEPT′ Guidance on selecting airway devices: The basis of a strategy for equipment evaluation. Anaesthesia 2011;66:726-37. 3. Miller DM. A proposed classification and scoring system for supraglottic sealing airways: A brief review. Anesth Analg 2004;99:1553-9. 4. Brimacombe JR, Berry A. The incidence of aspiration associated with the laryngeal mask airway: A meta-analysis of published literature. J Clin Anesth 1995;7:297-305. 5. Monem A, Khan FA. Laryngeal mask airway insertion anaesthesia and insertion techniques. J Pak Med Assoc 2007;57:607-11. 6. Hernandez MR, Klock PA Jr, Ovassapian A. Evolution of the extraglottic airway: A review of its history, applications, and practical tips for success. Anesth Analg 2012;114:349-68. 7. Ouellette RG. The effect of nitrous oxide on laryngeal mask cuff pressure. AANA J 2000;68:411-4. 8. Keller C, Puhringer F, Brimacombe JR. Influence of cuff volume on oropharyngeal leak pressure and fibreoptic position with the laryngeal mask airway. Br J Anaesth 1998;81:186-7. 9. Brimacombe J. The advantages of the LMA over the tracheal tube or facemask: A meta-analysis. Can J Anaesth 1995;42:1017-23. 10. Tanaka A, Isono S, Ishikawa T, Sato J, Nishino T. Laryngeal resistance before and after minor surgery: Endotracheal tube versus Laryngeal Mask Airway. Anesthesiology 2003;99:252-8. 11. Baskett PJ. The laryngeal mask in resuscitation. Resuscitation 1994;28:93-5. 12. Fujii Y, Tanaka H, Toyooka H. Circulatory responses to laryngeal mask airway insertion or tracheal intubation in normotensive and hypertensive patients. Can J Anaesth 1995;42:32-6. 13. Pennant JH, White PF. The laryngeal mask airway. Its uses in anesthesiology. Anesthesiology 1993;79:144-63. 14. Valentine J, Stakes AF, Bellamy MC. Reflux during positive pressure ventilation through the laryngeal mask. Br J Anaesth 1994;73:543-4. 15. Owens TM, Robertson P, Twomey C, Doyle M, McDonald N, McShane AJ. The incidence of gastroesophageal reflux with the laryngeal mask: A comparison with the face mask using esophageal lumen pH electrodes. Anesth Analg 1995;80:980-4. 16. Hodzovic I. Airway management disasters-lessons from the United Kingdom. Acta Clin Croat 2012;51:525-7. 17. Maltby JR, Beriault MT, Watson NC, Fick GH. Gastric distension and ventilation during laparoscopic cholecystectomy: LMA-classic vs. tracheal intubation. Can J Anaesth 2000;47:622-6. 18. Taheri A, Hajimohamadi F, Soltanghoraee H, Moin A. Complications of using laryngeal mask airway during anaesthesia in patients undergoing major ear surgery. Acta Otorhinolaryngol Ital 2009;29:151-5. 19. Lopez-Gil M, Brimacombe J, Keller C. A comparison of four methods for assessing oropharyngeal leak pressure with the laryngeal mask airway in paediatric patients. Paediatr Anaesth 2001;11:319-21. 20. Keller C, Brimacombe JR, Keller K, Morris R. Comparison of four methods for assessing airway sealing pressure with the laryngeal mask airway in adult patients. Br J Anaesth 1999;82:286-7. 21. George JM, Sanders GM. The reinforced laryngeal mask in paediatric outpatient dental surgery. Anaesthesia 1999;54:546-51. 22. Choo CY, Koay CK, Yoong CS. A randomised controlled trial comparing two insertion techniques for the Laryngeal Mask Airway Flexible™ in patients undergoing dental surgery. Anaesthesia 2012;67:986-90. 23. Flynn P, Ahmed FB, Mitchell V, Patel A, Clarke S. A randomised comparison of the single use LMA Flexible™ with the reusable LMA Flexible™ in paediatric dental day-case patients. Anaesthesia 2007;62:1281-4. 24. 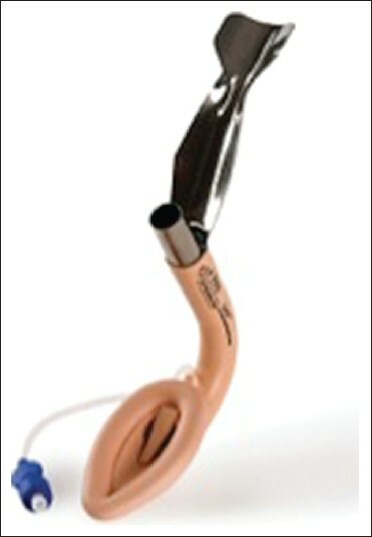 Shimoda O, Yoshitake A. Stylet for reinforced laryngeal mask airway. Anaesthesia 2002;57:1140-1. 25. William A, Chambers NA, Erb TO, von Ungern-Sternberg BS. Incidence of sore throat in children following use of flexible laryngeal mask airways-impact of an introducer device. Pediatr Anesth 2010;20:839-43. 26. Brain AI, Verghese C, Strube PJ. 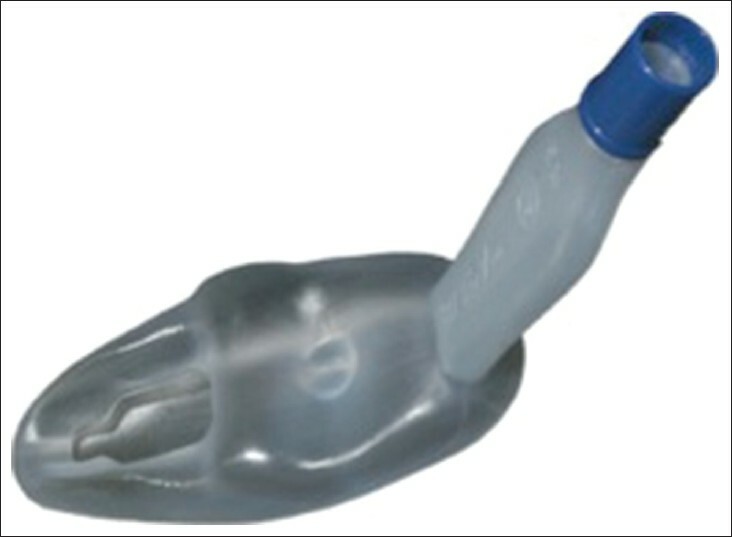 The LMA ′ProSeal′-a laryngeal mask with an oesophageal vent. Br J Anaesth 2000;84:650-4. 27. Howath A, Brimacombe J, Keller C, Kihara S. Gum elastic bougie-guided placement of the ProSeal laryngeal mask. Can J Anaesth 2002;49:528-9. 28. Howath A, Brimacombe J, Keller C. Gum-elastic bougie-guided insertion of the ProSeal laryngeal mask airway: A new technique. Anaesth Intensive Care 2002;30:624-7. 29. Brimacombe J, Keller C, Judd DV. Gum elastic bougie-guided insertion of the ProSeal laryngeal mask airway is superior to the digital and introducer tool techniques. Anesthesiology 2004;100:25-9. 30. Martinez-Pons V, Madrid V. Ease placement of LMA ProSeal with a gastric tube inserted. Anesth Analg 2004;98:1816-7. 31. O′Connor CJ Jr, Davies SR, Stix MS, Dolan RW. Gastric distention in a spontaneously ventilating patient with a ProSeal laryngeal mask airway. Anesth Analg 2002;94:1656-8. 32. O′Connor CJ Jr, Stix MS. Bubble solution diagnoses ProSeal insertion into the glottis. Anesth Analg 2002;94:1671-2. 33. Braun U, Zerbst M, Füllekrug B, Gentzel I, Hempel V, Leier M, et al. A comparison of the Proseal laryngeal mask to the standard laryngeal mask on anesthesized, non-relaxed patients. Anasthesiol Intensivmed Notfallmed Schmerzther 2002;37:727-33. 34. Brimacombe J, Richardson C, Keller C, Donald S. Mechanical closure of the vocal cords with the laryngeal mask airway ProSeal. Br J Anaesth 2002;88:296-7. 35. Stix MS, Rodriguez-Sallaberry FE, Cameron EM, Teague PD, O′Connor CJ Jr. Esophageal aspiration of air through the drain tube of the ProSeal laryngeal mask. Anesth Analg 2001;93:1354-7. 36. van Zundert A, Brimacombe J. The LMA Supreme-a pilot study. Anaesthesia 2008;63:209-10. 37. Hosten T, Gurkan Y, Ozdamar D, Tekin M, Toker K, Solak M. A new supraglottic airway device: LMA-Supreme™, comparison with LMA-Proseal™. Acta Anaesthesiol Scand 2009;53:852-7. 38. Cook TM, Gatward JJ, Handel J, Hardy R, Thompson C, Srivastava R, et al. Evaluation of the LMA Supreme™ in 100 non-paralysed patientsFNx01. Anaesthesia 2009;64:555-62. 39. Brain AI, Verghese C, Addy EV, Kapila A. The intubating laryngeal mask. I: Development of a new device for intubation of the trachea. Br J Anaesth 1997;79:699-703. 40. Haardt V, Lenfant F, Cailliod R, Freysz M. Tracheal intubation through the intubating laryngeal mask airway training on manikin: Comparison of single use and reusable devices from the same manufacturer. Ann Fr Anesth Reanim 2008;27:297-301. 41. Teoh WH, Lim Y. Comparison of the single use and reusable intubating laryngeal mask airway. Anaesthesia 2007;62:381-4. 42. 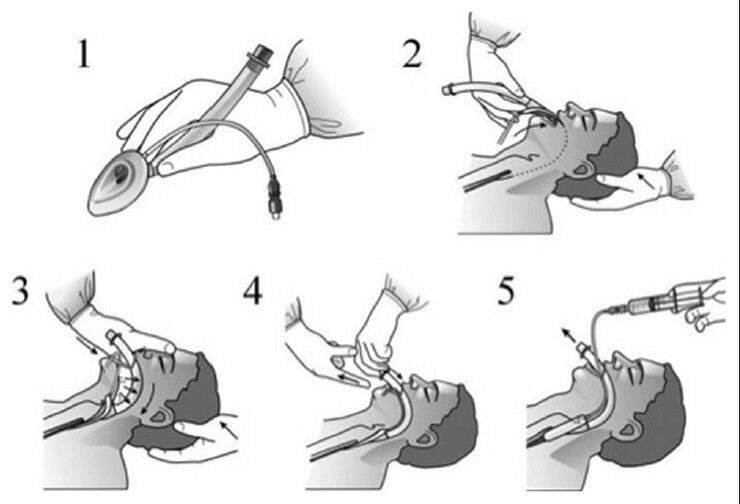 Verghese C. Laryngeal mask airway devices: Three maneuvers for any clinical situation. Anesthesiology News 2010;36. 43. Ferson DZ, Rosenblatt WH, Johansen MJ, Osborn I, Ovassapian A. Use of the Intubating LMA-Fastrach™ in 254 Patients with Difficult-to-manage Airways. Anesthesiology 2001;95:1175-81. 44. Bercker S, Schmidbauer W, Volk T, Bogusch G, Bubser HP, Hensel M, et al. A comparison of seal in seven supraglottic airway devices using a cadaver model of elevated esophageal pressure. Anesth Analg 2008;106:445-8. 45. Choyce A, Avidan MS, Patel C, Harvey A, Timberlake C, McNeilis N, et al. Comparison of laryngeal mask and intubating laryngeal mask insertion by the naive intubator. Br J Anaesth 2000;84:103-5. 46. Asai T, Wagle AU, Stacey M. Placement of the intubating laryngeal mask is easier than the laryngeal mask during manual in-line neck stabilization. Br J Anaesth 1999;82:712-4. 47. Karim YM, Swanson DE. Comparison of blind tracheal intubation through the intubating laryngeal mask airway (LMA Fastrach) and the Air-Q. Anaesthesia 2011;66:185-90. 48. Sudhir G, Redfern D, Hall JE, Wilkes AR, Cann C. A comparison of the disposable Ambu AuraOnce Laryngeal Mask with the reusable LMA Classic laryngeal mask airway. Anaesthesia 2007;62:719-22. 49. Suzanna AB, Liu CY, Rozaidi SW, Ooi JS. Comparison between LMA-Classic and AMBU AuraOnce laryngeal mask airway in patients undergoing elective general anaesthesia with positive pressure ventilation. Med J Malaysia 2011;66:304-7. 50. Shariffuddin II, Wang CY. Randomised crossover comparison of the Ambu AuraOnce Laryngeal Mask with the LMA Classic laryngeal mask airway in paralysed anaesthetised patients. Anaesthesia 2008;63:82-5. 51. Cook TM, Lowe JM. An evaluation of the Cobra Perilaryngeal Airway: Study halted after two cases of pulmonary aspiration. Anaesthesia 2005;60:791-6. 52. Francksen H, Bein B, Cavus E, Renner J, Scholz J, Steinfath M. Comparison of LMA Unique, Ambu laryngeal mask and Soft Seal laryngeal mask during routine surgical procedures. Eur J Anaesthesiol 2007;24:134-40. 53. Andrews DT, Williams DL, Alexander KD, Lie Y. Randomised comparison of the classic laryngeal mask airway with the cobra perilaryngeal airway during anaesthesia in spontaneously breathing adult patients. Anaesth Intensive Care 2009;37:85-92. 54. Turkmen A, Ali M, Akkaya et al. Supreme-LMA vs Cobra PLA: 19AP1-1. Eur J Anaesthesiol 2010;27:244. 55. Agro F, Frass M, Benumof JL, Krafft P. Current status of the Combitube™: A review of the literature. J Clin Anesth 2002;14:307-14. 56. Galvin EM, van Doorn M, Blazquez J, Ubben JF, Zijlstra FJ, Klein J, et al. A randomized prospective study comparing the cobra perilaryngeal airway and laryngeal mask airway-classic during controlled ventilation for gynecological laparoscopy. Anesth Analg 2007;104:102-5. 57. Gaitini L, Carmi N, Yanovski B, Tome R, Resnikov I, Gankin I, et al. Comparison of the CobraPLA (Cobra Perilaryngeal Airway) and the Laryngeal Mask Airway Unique in children under pressure controlled ventilation. Paediatr Anaesth 2008;18:313-9. 58. Hooshangi H, Wong DT. Brief review: The Cobra Perilaryngeal Airway (CobraPLA and the Streamlined Liner of Pharyngeal Airway (SLIPA) supraglottic airways. Can J Anaesth 2008;55:177-85. 59. Bein B, Carstensen S, Gleim M, Claus L, Tonner PH, Steinfath M, et al. A comparison of the proseal laryngeal mask airway (TM), the laryngeal tube S (R) and the oesophageal-tracheal combitube (TM) during routine surgical procedures. Eur J Anaesthesiol 2005;22:341-6. 60. Dörges V, Ocker H, Wenzel V, Schmucker P. The laryngeal tube: A new simple airway device. Anesth Analg 2000;90:1220-2. 61. Chung CJ, Lee KH, Choi SR, Kim DC, Lee SC. Comparison of the CobraPLA and the LMA Classic airway devices during volume-controlled ventilation in children. Korean J Anesthesiol 2008;55:145-9. 62. Mercer MH, Gabbott DA. Insertion of the Combitube airway with the cervical spine immobilised in a rigid cervical collar. Anaesthesia 1998;53:971-4. 63. Calkins MD, Robinson TD. Combat trauma airway management: Endotracheal intubation versus laryngeal mask airway versus combitube use by Navy SEAL and Reconnaissance combat corpsmen. J Trauma 1999;46:927-32. 64. Krafft P, Röggla M, Fridrich P, Locker GJ, Frass M, Benumof JL. Bronchoscopy via a redesigned Combitube in the esophageal position. A clinical evaluation. Anesthesiology 1997;86:1041-5. 65. Oczenski W, Krenn H, Dahaba AA, Binder M, El-Schahawi-Kienzl I, Kohout S, et al. Complications following the use of the Combitube, tracheal tube and laryngeal mask airway. Anaesthesia 1999;54:1161-5. 66. Uppal V, Fletcher G, Kinsella J. 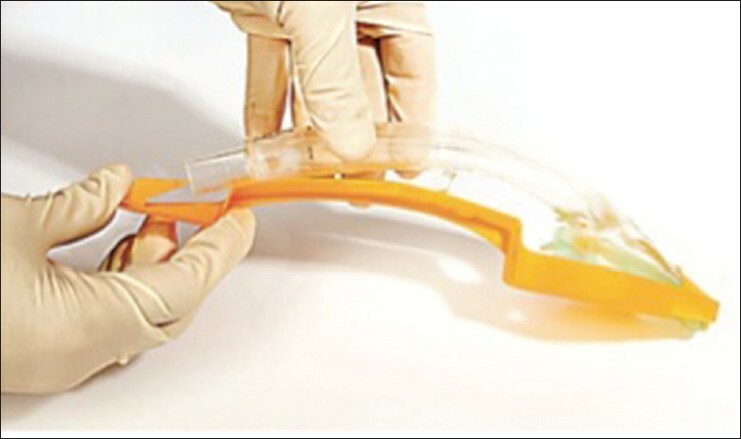 Comparison of the I-gel with the cuffed tracheal tube during pressure-controlled ventilation. Br J Anaesth 2009;102:264-8. 67. Beylacq L, Bordes M, Semjen F, Cros AM. The I-gel, a single-use supraglottic airway device with a non-inflatable cuff and an esophageal vent: An observational study in children. Acta Anaesthesiol Scand 2009;53:376-9. 68. Gibbison B, Cook TM, Seller C. Case series: Protection from aspiration and failure of protection from aspiration with the I-gel airway. Br J Anaesth 2008;100:415-7. 69. Asai T, Kawashima A, Hidaka I, Kawachi S. The laryngeal tube compared with the laryngeal mask: Insertion, gas leak pressure and gastric insufflation. Br J Anaesth 2002;89:729-32. 70. Brimacombe J, Keller C, Brimacombe L. A comparison of the laryngeal mask airway ProSeal™ and the laryngeal tube airway in paralyzed anesthetized adult patients undergoing pressure-controlled ventilation. Anesth Analg 2002;95:770-6. 71. Dorges V, Ocker H, Wenzel V, Steinfath M, Gerlach K. The Laryngeal Tube S: A modified simple airway device. Anesth Analg 2003;96:618-21. 72. Zundert TV, Gatt S. The Baska Mask®-A new concept in self-sealing membrane cuff extraglottic airway devices, using a sump and two gastric drains: A critical evaluation. J Obstet Anaesth Crit Care 2012;2:23-30. 73. Alexiev V, Salim A, Kevin LG, Laffey JG. An observational study of the Baska (R) mask: A novel supraglottic airway. Anaesthesia 2012;67:640-5. 74. Emmerich M, Tiesmeier J. 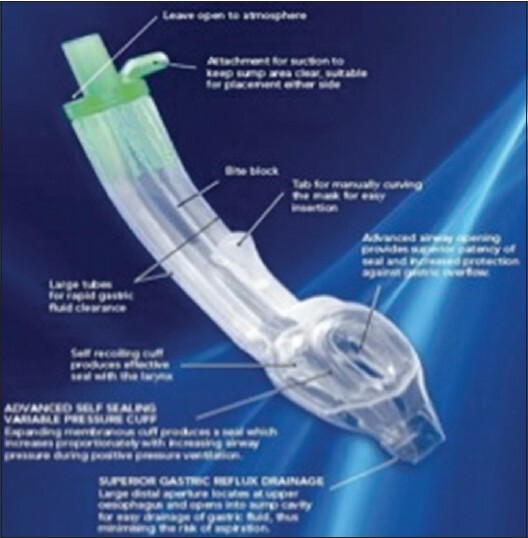 The I-gel supraglottic airway: A useful tool in case of difficult fiberoptic intubation. Minerva Anestesiol 2012;78:1169-70. 75. Das B, Mitra S, Jamil SN, Varshney RK. Comparison of three supraglottic devices in anesthetised paralyzed children undergoing elective surgery. Saudi J Anaesth 2012;6:224-8. 76. Galgon RE, Schroeder K, Joffe AM. The self-pressurising air-Q® Intubating Laryngeal Airway for airway maintenance during anaesthesia in adults: A report of the first 100 uses. Anaesth Intensive Care 2012;40:1023-7. 77. Erlacher W, Tiefenbrunner H, Kästenbauer T, Schwarz S, Fitzgerald RD. CobraPLUS and Cookgas air-Q versus Fastrach for blind endotracheal intubation: A randomised controlled trial. Eur J Anaesthesiol 2011;28:181-6. 78. Whyte SD, Cooke E, Malherbe S. Usability and performance characteristics of the pediatric air-Q (R) intubating laryngeal airway. Can J Anaesth 2013;60:557-63. 79. Hein C, Plummer J, Owen H. Evaluation of the SLIPA (streamlined liner of the pharynx airway), a single use supraglottic airway device, in 60 anaesthetized patients undergoing minor surgical procedures. Anaesth Intensive Care 2005;33:756-61. 80. Wong DT, Yang JJ, Mak HY, Jagannathan N. Use of intubation introducers through a supraglottic airway to facilitate tracheal intubation: A brief review. Can J Anaesth 2012;59:704-15. 81. Blair EJ, Mihai R, Cook TM. Tracheal intubation via the Classic and Proseal laryngeal mask airways: A manikin study using the Aintree Intubating Catheter. Anaesthesia 2007;62:385-7. 82. Hagberg C. Benumof and Hagberg′s Airway Management. 3 rd ed. Philadelphia: Saunders; 2013. 83. Verghese C, Smith TG, Young E Prospective survey of use of Laryngeal mask airway in 2359 patients. Anaesthesia 1993 Jan; 48:58-60.